There is growing consensus among scientists that many of the fossils found in various parts of Africa that have been dated to 200 000 years ago are those of archaic Homo sapiens, precursors to anatomically modern humans. It is also generally accepted now that the Mid Stone Age Florisbad skull found in South Africa and dated by electron spin resonance to between 294 000 and 224 000 years ago, although previously labelled Homo helmei because of the extreme dome shape of the skull, is in fact archaic Homo sapiens. Now, recent DNA testing on the fossilised remains of an ancient male juvenile found near Balito Bay in KwaZulu Natal, South Africa moves the timeline for the emergence of Homo sapiens in Africa further back to between 260 000 and 350 000 years ago. In a recent paper published online by Science and titled, Ancient genomes from southern Africa pushes modern human divergence beyond 260,000 years ago, C. Schlebusch et al claim that archaeological, fossil and genetic data consistently show that the earliest traces of anatomically modern humans are found in sub-Saharan Africa, with South Africa considered to be one of the ‘hot spots’ for the evolution of our species. 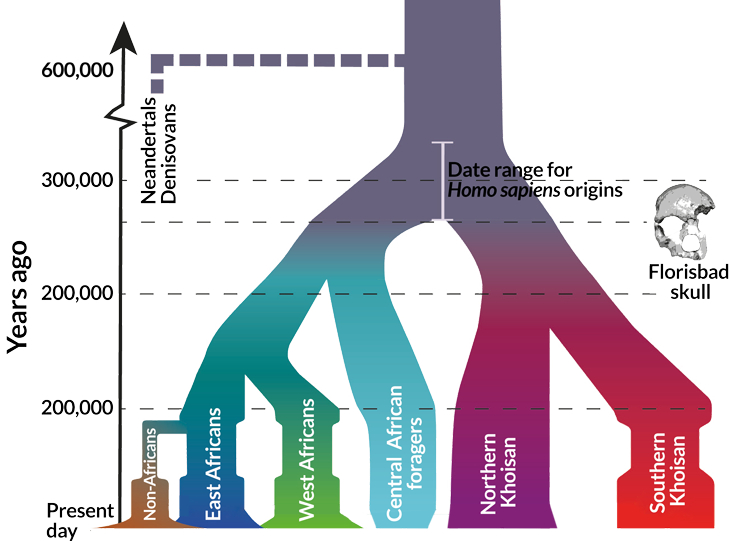 Using several complementary approaches in their study to develop a coalescent based approach, Schlebusch and the team generated and analysed genome sequence data of seven ancient individuals found in South Africa to establish when Homo sapiens first diverged from other species in Africa. In coalescent approaches, the genealogy of specific genes is traced back using a ‘family tree’ like structure to establish a pattern of descent and establish common ancestry. The model derived is a random probability distribution that may be analysed statistically (but not predicted precisely). When the genetic data is considered together with that from other areas of study including archaeology, palaeoanthropology and palaeoenvironmental research, the statistical analysis can be accepted with greater confidence. Carina Schlebusch and the team analysed the DNA from three South African Stone Age hunter-gatherers (including the Balito Bay A boy) whose genetics were shown to relate to the present-day southern San people, and four Iron Age farmers whose genetic signatures are related to present day Bantu speakers. Data from other recent studies made by Harvard’s Pontus Skoglund indicate that Stone Age humans travelled across Africa and even interbred. The analysis of mid Stone Age hunter-gatherers’ genetic signatures from East Africa and South Africa show a common ancestry, uninfluenced by the later migration of West African farmers. The DNA of the Stone Age hunter-gatherer child found near Balito Bay was completely unaffected by any of the migrating East African herders, farmers from West Africa or Eurasian immigrants into Southern Africa, and thus provided a good benchmark for establishing when divergence occurred through comparison to the DNA of modern humans and Stone Age Neanderthals and Denisovans. The Schlebusch team’s findings indicate that the deepest split among modern humans occurred 260 000 years ago, which implies that H. sapiens first emerged in Africa more than 260 000 years ago, with statistical probabilities indicating it was closer to 350 000 years ago. When considering the evidence of earlier dates for the emergence of Homo sapiens in Southern Africa, interesting questions are raised about their possible interactions with the other Homo species that existed in South Africa within that period, such as the recently identified Homo naledi. There is mounting evidence that they overlapped, and may well have interacted with each other. Genetic research has shown, for example, that early Homo sapiens mated with Homo neanderthalensis and that the DNA of most modern humans demonstrates a percentage of influence from the Neanderthals. The interactions of early Homo sapiens with other Homo species and their influences upon each other, however, have yet to be established. The Keys of Enoch® tells us that there were many cycles of human existence upon this planet before those that present-day scientists have accounted for and continuing research into Africa’s abundant fossil evidence is likely to establish that the ancestors of human beings existed much earlier than previously thought, evolving and outlasting the other Homo species eventually to dominate this planet.